Alderney with an area of just 3 square miles is the most northerly and the 3 rd largest of the Channel Islands. 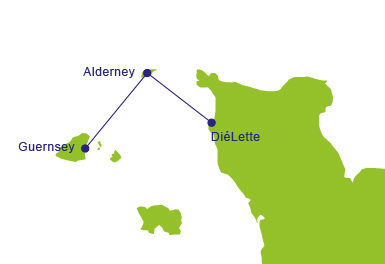 Alderney lies just 8 miles off the French coast of Normandy. Despite being so close to the French mainland, Alderney has managed to avoid mainstream tourism and still retains its serene environment rich in wild flora and fauna. St Annes, the capital of Alderney is also the centre of the community featuring colour washed houses, cobbled streets, shops, a post office, restaurants, hotels and banks and the magnificent 'Cathedral of the Channel Islands' at its centre. There are many welcoming pubs and restaurants on the island and there's even a gauge railway (the only one in the Channel Islands). Highlights are: Bird watching - home to almost 300 species of bird and includes 2% of the world's gannet population; Beaches - some of the sandiest beaches - Branve and Longis being the most popular.